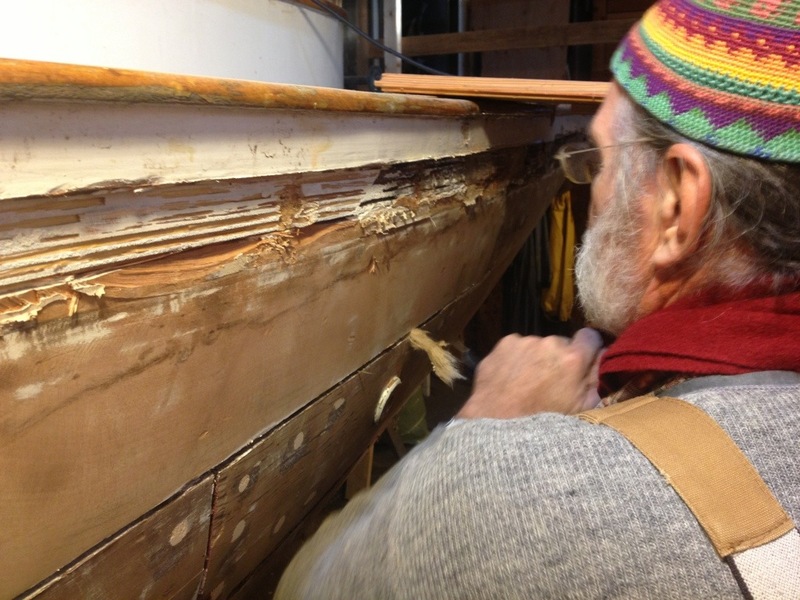 Reefing the seams today on Dorothy’s port side. Bit by bit, inch by inch, the caulking is being pried out. Tony Grove is working with David Baker today and tomorrow. 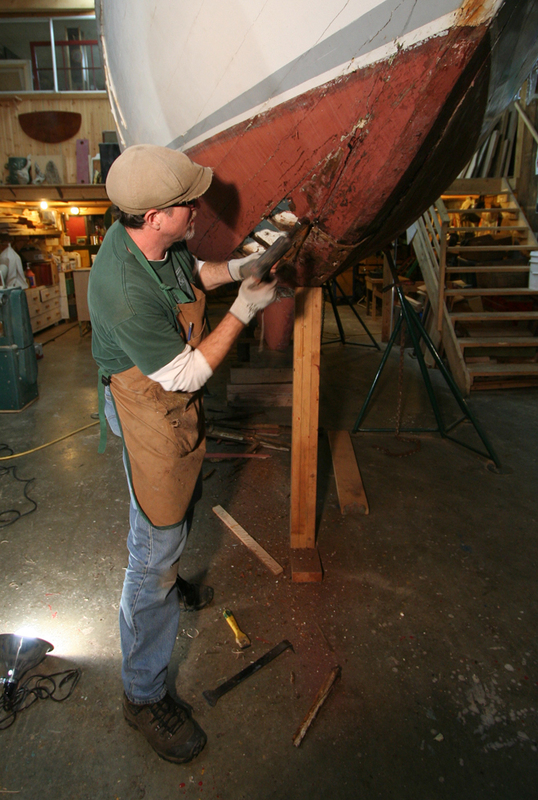 David had owned Dorothy in the 1980s and is working in some areas around planks that he himself installed. Together they are uncovering some surprising materials used to pay her seams over the years. 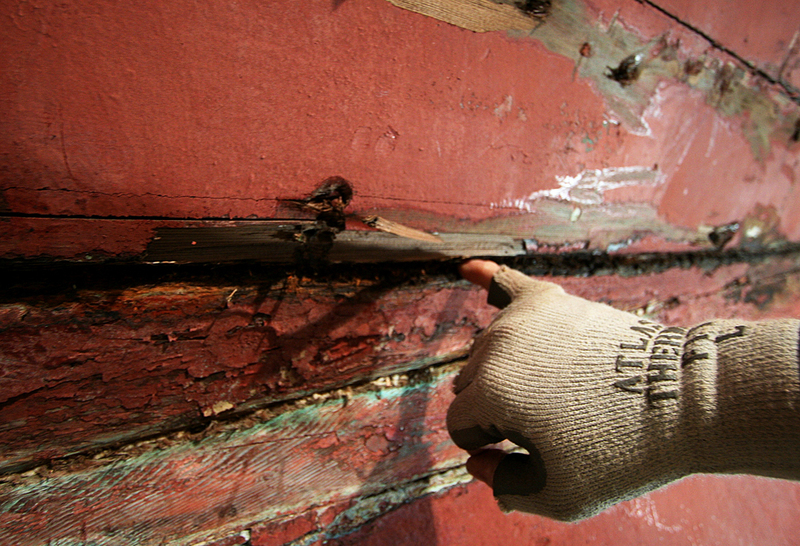 In some cases, the caulking material hasn’t been touched at all, meaning it’s original, and 116 years old. In early January, trustees John West and Eric Waal from the Maritime Museum of B.C. arrived on Gabriola to discuss Tony Grove’s discoveries regarding Dorothy. Tony had conducted an exploratory in late December which revealed the cause and extent of the century-old boat’s issues, and the trustees were about to hear the verdict, and to deliver their own about the next steps for the restoration. As representatives of Dorothy‘s owner and ultimate caretaker, the Museum, and as those who know the most about her file, West and Waal will be significant voices in the documentary BETWEEN WOOD AND WATER. (I call them “the Bulldog” and “the Greyhound”.) It was Eric (above, at right) who first voiced concern over the fact that Dorothy‘s legacy fund was being depleted by storage fees, and doggedly set about bringing attention to her future. He convinced West (at left) to return to the board and between the two of them they have developed a strategy to get the old girl back into the water. “I basically had two suggestions: the first, and the cheapest, would be to put Dorothy back together with some new wood and floors and some deliberate caulking below the waterline; the second is to wood the hull, reef all the seams, repair any planking or damage, refasten where possible and re-caulk her whole hull. And so it was decided that the old girl will undergo an extensive restoration – as extensive as the Museum can raise the funds for – this coming spring and summer. Tony estimates it will take approximately double the number work hours that was originally anticipated, but since it will have to be done at some point in her near future, both West and Waal decided that it might as well be done now. As the saying goes… no use putting off til tomorrow what can be done today. For the purposes of the film, we continue to document critical points but won’t start principal photography until mid-March, when Tony actually begins her restoration. We continue to look for a broadcasting partner for the story and have some interesting possibilities, but no confirmed partners yet. Still, we believe that Dorothy is such an intriguing way to explore B.C.’s coastal history that her story will find a way to an audience, somehow. She has waited a long time for her moment to shine, and you can be sure we will be there to capture it! Kate Bradford filming trustees John West and Eric Waal, along with Tony Grove, from Dorothy’s bow. Photo by Emily Grove. 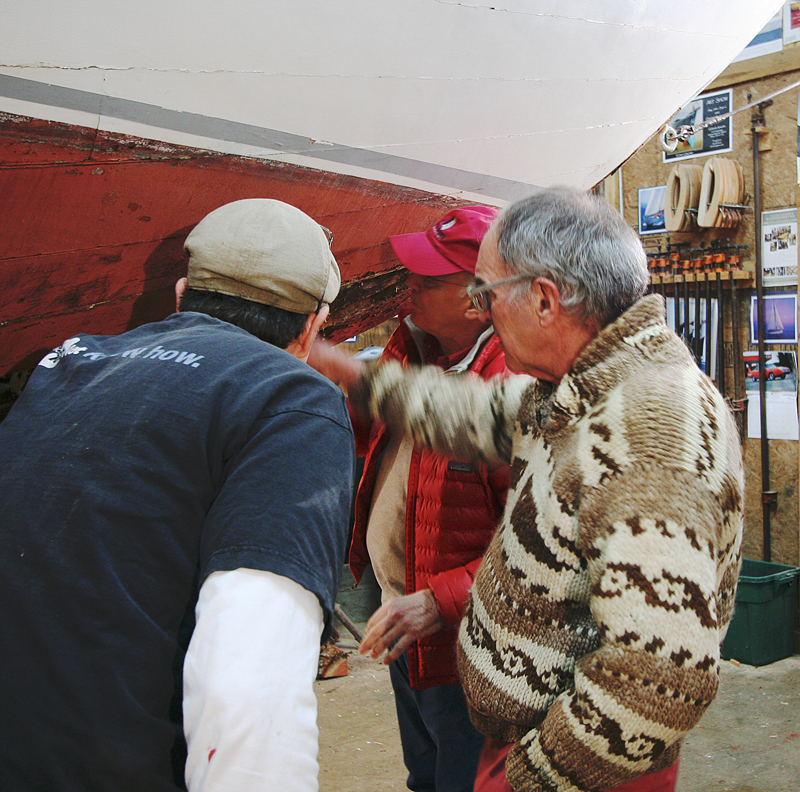 It was important to document the process of “discovery” before Tony Grove can begin restoring Dorothy in March. He needs to know what he’s up against: how extensive the restoration will be and – more importantly for the Museum – whether it can be done in time and on budget. 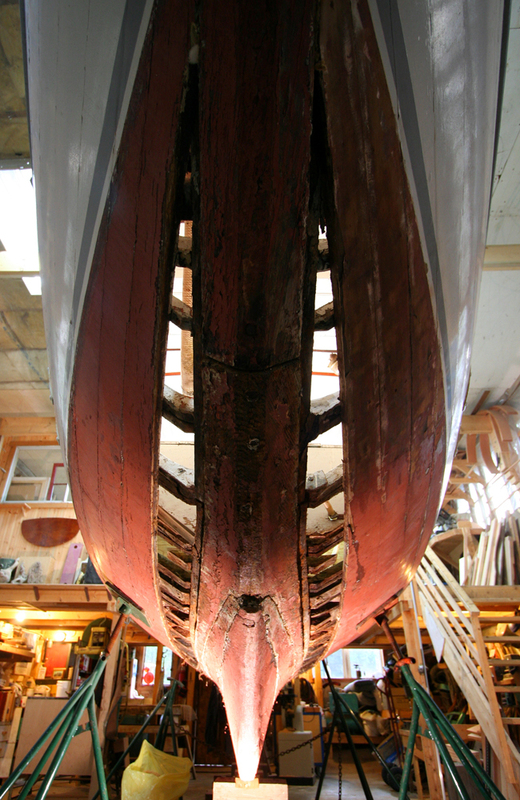 If her keel needed to be replaced, for example, that could mean she wouldn’t be ready for the race in September, and the Maritime Museum would have to spend more time fundraising. Much then, hinged on what Tony discovered in this exploratory. The day finally arrived, Wednesday December 18. Kate Bradford and I (Tobi) drove through Gabriola’s first snowfall to Tony’s boat shop on the south end of the island. We had two cameras in tow: the Sony EX1 that both Kate and I use on a regular basis, and a Hero2 GoPro for getting into the odd angles and tight spots. The waterproof, shock-proof casing is invaluable and I’ve used it everywhere from snowmobiles in Nunavut and northern BC to underwater in Brazil. It’s a remarkable little invention and now we were excited to try it in the belly of Dorothy the sailboat. 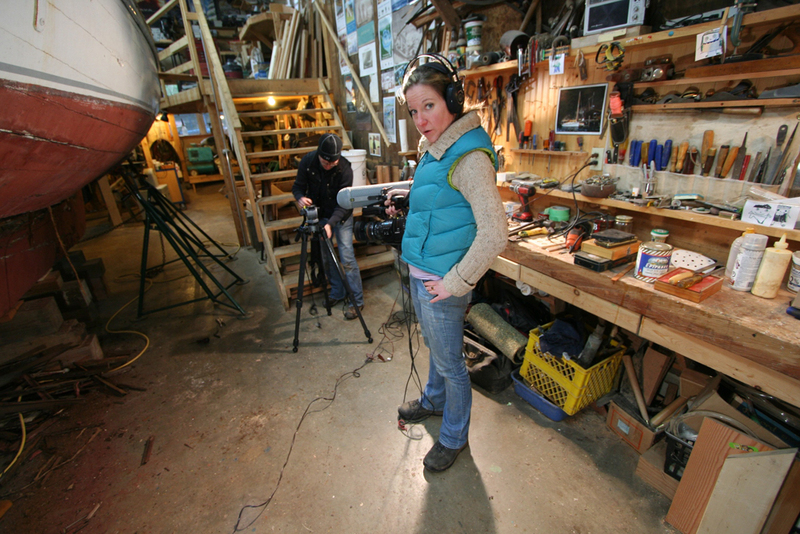 Kate Bradford (left) on camera, and Tobi Elliott on sound. Prep done, it was time to take a look for the first time beneath Dorothy‘s planks. It was a mystery even to Tony, who didn’t know what he would find. 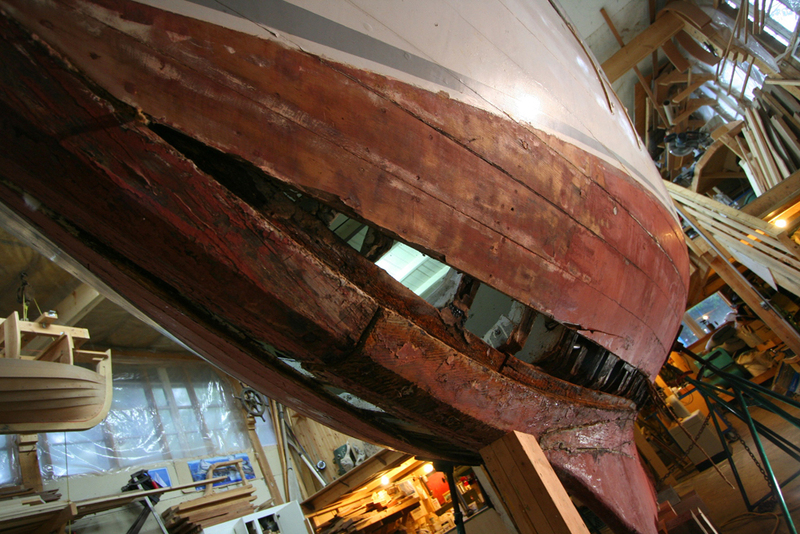 There were definite indications when looking at Dorothy from the outside that something was wrong – even a novice could tell parts of the boat seemed to be separating from one another (see image above) – but he couldn’t tell exactly what was causing it until he pried off her two garboards (the planks just above the keel) and took a look inside. As Tony started working, Kate followed on camera while I captured sound. It proved to be both a visual feast for the camera lens as well as a rich soundscape: a wide shot of Tony approaching the boat, then closeup detail as he ran his hand over the plank he was about to separate from her ribs; the “scrape, scrape, scrape” at the paint to uncover a fastening, and “thwack!” as he dug in a clawhammer, a closeup of the tools as they dug into the wood, then “bam! bam! bam! as he pounded the claw in with another hammer; a piece of wood being shoved into the crack of the garboard plank to keep it propped open, and then “creeeeeaaakkkkk” as the decades-old copper fastening groaned at being pulled from the wood; “clink” on the floor as Tony dropped it on the cement and then the sharp “CRACK!” as the wedged plank gave another inch or two. By day two, both of Dorothy’s garboards had been removed and Tony could see clearly what’s going on underneath. …. TO BE CONTINUED …. This is where we’ll update you week by week with new photos and behind-the-scenes bits as Tony begins the exploratory process on Dorothy.